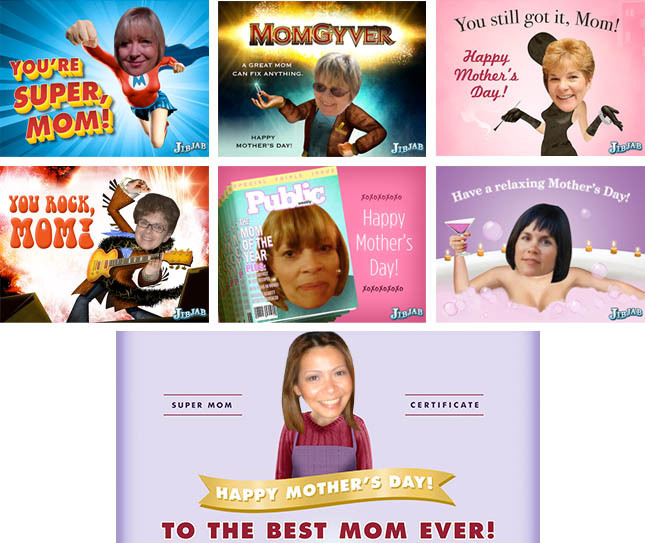 In tribute of our moms this Mother’s Day, we asked our staff to share some pictures of their moms to be honored in true JibJab style. Here’s to you, moms! You made us funny and we hope we’ve made you proud! All of these postables are up on our site, with loads of Mother’s Day videos and images. Check em out! This entry was written by paulhanges and posted on May 8, 2009 at 4:02 pm and filed under Holiday, Inside JibJab with tags jib jab, jibjab, jibjab.com, mother's day, starring you. Bookmark the permalink. Follow any comments here with the RSS feed for this post. Trackbacks are closed, but you can post a comment. to jibjab and the rest of the planet, let mom know she’s been there for you through the fun times and the hard ones, I tip my hat to all mom’s out there, cause if it wasnt for you, then none of us would be here!…..I raise a toast to mothers day, so celebrate!